, a writer who did not want either genius or learning, was born at Urbino, in Italy, in the fifteenth century; but the year is not named, nor have we any account of his early history. He was first known in the literary world by “A Collection of Proverbs,” 1498, and this being the first work of the kind, it occasioned some jealousy between him and Erasmus. 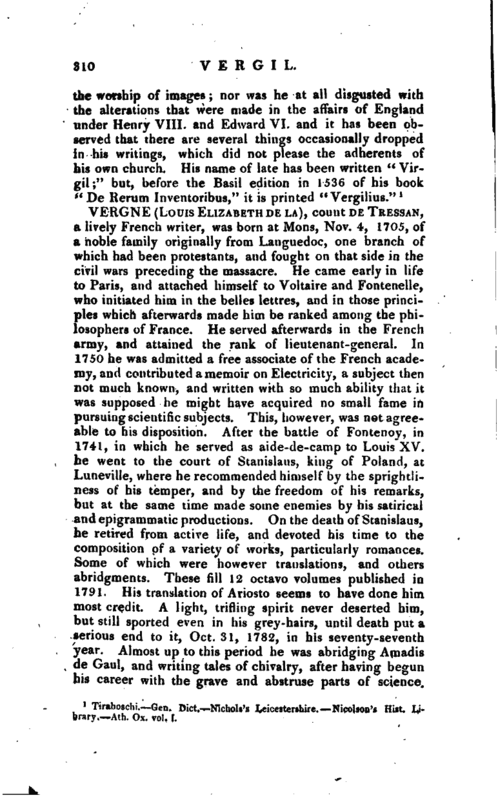 When Erasmus afterwards published his “Adagia,” and did not take notice of his work, Vergil reproached him in terms not civil, in the preface to his book “De llerum Inventoribus.” Their friendship, however, does not seem to have been interrupted by it; and Vergil, at the instigation of Erasmus, left the passage out in the later editions. These “Adagia” of Polydore Vergil were printed three or four times in a very short space; and this success encouraged him to undertake a more difficult work, his book “De Rerum Inventoribus,” printed in 1499. At the end of the 4th edition at Basil, 1536, 12mo, is subjoined a short commentary of his upon the Lord’s prayer. After this, he was sent into England by pope Alexander VI. to collect the papal tribute, called Peter-pence, and was the last collector of that oppressive tax. He recommended himself in this country so effectually to the powers in being, and was so well pleased with' it, that, having obtained the rectory of Church Langton in Leicestershire, he resolved to spend the remainder of his life in England. In 1507 he was presented to the archdeaconry of Wells, and prebend of | Nonnington, in the church of Hereford; and was the same year collated to the prebehd of Scamelsby in the church of Lincoln, which he resigned in 1513 for the prebend of Oxgate in that of St. Paul’s. In 1517 he published at London a new edition of his work “De Rerum Inventoribus,” then consisting of six books, with a prefatory address to his brother John Matthew Vergil. About 1521 he undertook a considerable work at the command of Henry VIII. ; upon which he spent above twelve years. It was a “History of England,” which he published and dedicated in 1533 to his royal patron. 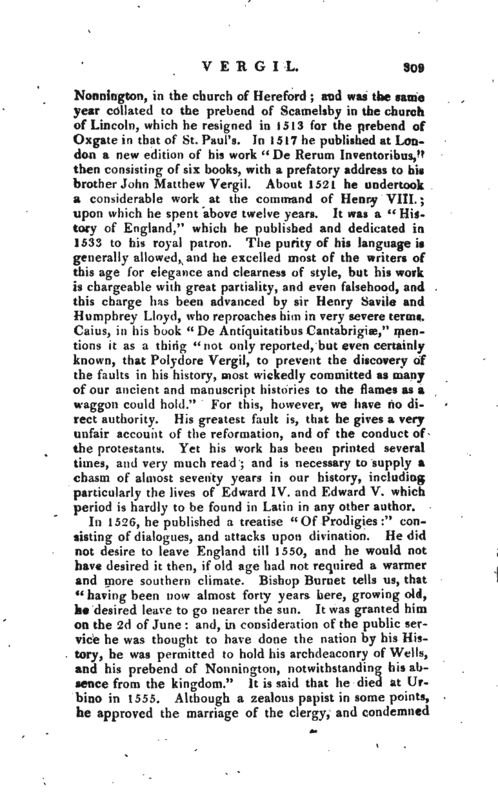 The purity of his language is generally allowed, and he excelled most of the writers of this age for elegance and clearness of style, but his work is chargeable with great partiality, and even falsehood, and this charge has been advanced by sir Henry Savile and Humphrey Lloyd, who reproaches him in very severe terms. 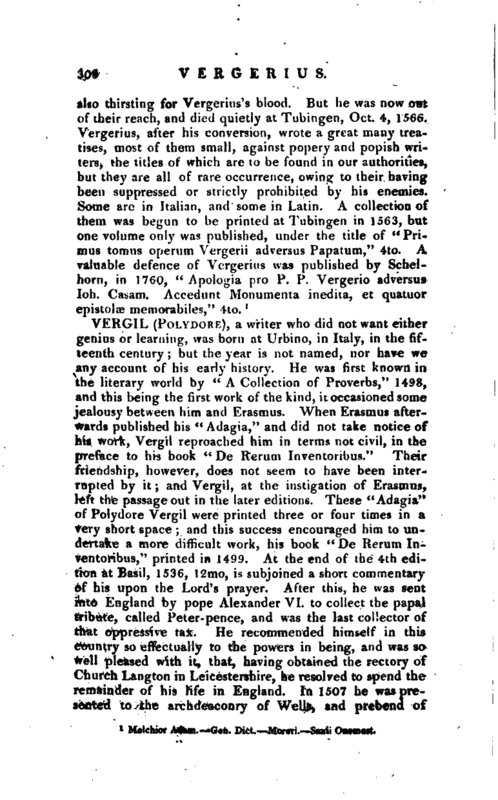 Caius, in his book “De Antiquitatibus Cantabrigiae,” mentions it as a thing “not only reported, but even certainly known, that Polydore Vergil, to prevent the discovery of the faults in his history, most wickedly committed as many of our ancient and manuscript histories to the flames as a waggon could hold.” For this, however, we have no direct authority. His greatest fault is, that he gives a very unfair account of the reformation, and of the conduct of the protestants. Yet his work has been printed several times, and very much read; and is necessary to supply a chasm of almost seventy years in our history, including particularly the lives of Edward IV. and Edward V. which period is hardly to be found in Latin in any other author. 1 Tiraboschi. Gen. Dict. Nichols’s Leicestershire. Nicolson’s Hist. Library. Atb. Ox. vol. I.